BT is a great British company doing a great job for Britain. We know this because communications minister Ed Vaizey said so in parliament. He was answering a question from one of his predecessors, Stephen Timms. Timms wanted to know why the entire rural superfast broadband fund is being handed to one company—to BT. “BT is now behaving like any monopolist that has everyone over a barrel, and we have heard about the consequences from all sides this morning. Why has competition been forgotten?” he said. Has BT exaggerated the 15 million homes with SFBB access? Only 20% of the lines in Cambridgeshire’s new fibre to the cabinets (FTTC) cabinets will be enabled for superfast broadband (SFBB). If this is the case in the rest of BT’s FTTC roll-out, it suggests that BT’s claims that 15 million homes have access to SFBB are wide of the mark. The revelation came at a feedback meeting to the Cambridgeshire Digital Champions on the county’s new contract with BT for next generation broadband. According to notes taken by Mel Bryan at the meeting, Annette Thorpe, BT’s regional director for the east of England, told the meeting that BT would apply the same criteria for populating DSLAM cabinets under the CCC (Cambridge County Council) contract as under the commercial areas. “DSLAM cabinets (which come in two sizes max. capacity 256 lines or 288 lines) will initially only have 20% of lines in the PCP offered SFBB,” Bryan wrote. 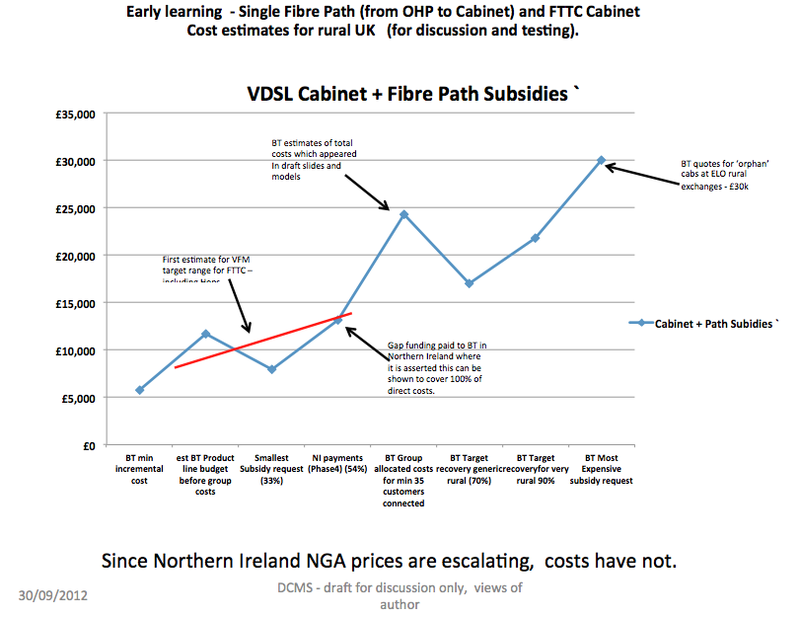 Almost two years ago Kevin McNulty, Openreach’s general manager for next generation access commercial partners, told Br0kenTeleph0n3 BT’s NGA financial plan was based on a breakeven period of 10 to 12 years and a 20% take-up. Bryan reported Noelle Godfrey, programme director of Connecting Cambridgeshire (CC), said CCC expects 90% of premises will be covered by SFBB speeds above 24Mbps plus a further 8% of premises will be covered by “fibre” below 24Mbs. 2% will receive at least 2Mbps. Where this speed is measured is not defined. Thorpe told the meeting the BDUK’s £6.7m contribution to Cambridgeshire had to be spent “within the life time of the current parliament” which ends on 17 May, 2015. This gives BT an installation period of just over two years. The meeting heard that 20 suppliers had registered an interest in the county’s project. Only three were chosen for “dialogue” after which BT was chosen “for offering the widest coverage and best value”. The names of the other suppliers were not disclosed, nor was the methodology by which value was measured. More details of the project plan are expected in May.